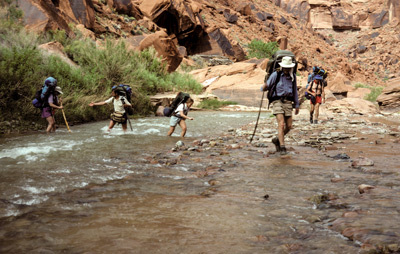 In 1980, eight of us did a week long backpack in the lower part of the Escalante river system. We hiked in from the Hurricane Wash trail head, to Coyote Gulch, down that gulch to the river, and up the river to what is now Neon Canyon, and out at Fence Canyon. (Fence is the usual route that people today day hike into the Escalante so they can see the Golden Cathedral in Neon Canyon.) To say that the 1980 trip was tough is likely an understatement. Yes, Hurricane Wash and Coyote Gulch were sublime (if you discount my first encounter with quicksand, sinking crotch deep) but the stretch of the river from the mouth of Coyote, up to perhaps the mouth of Moody Canyon, it a real challenge. There are room- and cabin-size boulders in the river bed, footing can be tricky, and it is non-stop route finding. If you are not fording the river, you can be bashing through the infernal tamarisk. As a result, we were trying to cover so many miles that frankly, we really did not savor the experience. And side canyons? What side canyons? We barely had the time or energy to fart, let alone explore any of the canyons feeding into the Escalante. Well, after nine more canyon backpacks under our hip belts, we decided to revisit the lower Escalante in 1992 (we have since been further down in the drainage, to Davis and 50 Mile Creeks). The idea was to come into Coyote Gulch a different way (down the Dry Fork), spend a day going up into Steven’s canyon, and spend a fair amount of time poking around in lower Fool’s Canyon. We made the days shorter than they were in 1980 (the 12 miles from Fools to Scorpion took us 10 hours hiking as hard as we could), but did not plan on the heat. This turned out to be one of the hottest trips we have done, and I have now done 40 backpacking trips on the Colorado Plateau. As I was scanning the slides that form the basis of the trip report, I was taken by how many things have changed for backpacking since 1992. That is, except the 23 years older that we have all gotten. These things come to mind: (Note: if you are not interested in the commentary below, just click on this to get started with the slide show. 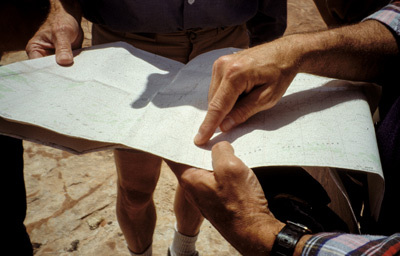 When we did that first trip in 1980, there was basically nothing available to plan the trip, other than some comments in a sketched map from the BLM. In the mi-1980’s, there were several hiking guides published, including the definitive guide by Rudy Lambrechtse, Hiking the Escalante. Also, Michael Kelsey, the guru of canyon country, began publishing a series of guide books. The first edition of his “Canyon Hiking Guide to the Colorado Plateau” included some maps and descriptions of both the Lower and upper Escalante River canyons. But by 1992, that was sort of the state of the art. The internet was just starting to become popular, but personal computers for home cost a fortune by today’s standards. But just think of the resources available today: free 1:24,000 scale topo maps, digital mapping software that runs on your computer and that can be personalized, satellite and aerial photos sufficiently detailed that you can actually COUNT the big boulders in the Escalante River between Stevens and Fools Canyons. 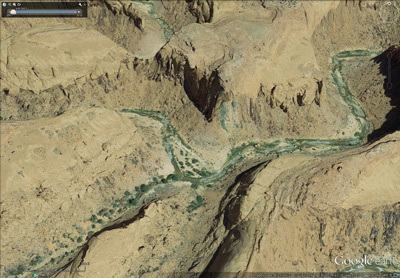 Do a Google search for anything related to the Escalante River canyon and the results will keep you busy for days. I have even used satellite photos to determine if water will likely be available from smaller tributary canyons. And of course, there is the vastly greater ease of ancillary scheduling: planning your route if you are driving, or scheduling airline flights, etc. Yes, things are much easier now. Of course, in 1980, when we went in what one might consider prime time (first week of May), we saw only two parties, once we left the mouth of Coyote Gulch, in the 5.5 days to Fence Canyon. Today, you would be lucky if you only saw a few parties per day, I suspect. When you look at the photos of this trip, you will see most of us are using external frame packs. I had moved to an internal frame pack by this time, for off-trail hiking in the Great Smoky Mtns National Park, but because it was heavier, I tended not to use it for canyon trips. In retrospect, such is pretty dumb, simply because when there are a lot of rocks, no formal trails, and vegetation to bust thru, having an internal frame pack helps one maintain one’s balance. Also, if you notice photos of the tents, many of us were using what was then the latest in lightweight, high tech tents: the Sierra Designs Clip Flashlights 2 and 3. Materials have changed, and certainly today, the tents would be considered heavy. Virtually everyone was using liquid fuel stoves, whereas today, most people have switched to very lightweight alcohol or butane/propane canister stoves. Note the absence of trekking poles. We all seem to use them these days. Aging knees? Maybe just getting smart? Several of us used Crazy Creek Chairs, one of the best inventions of backpacking. But the past few years, we don’t seem to want to carry the weight, so we use adapters for our Thermarest chairs. Like most of the lightweight gear, they are not as comfortable as the original (or sturdy, or durable), but they are lighter. The first few years of the 1990’s appears to have been the last hurrah for route finding or position confirmation using compass and maps. Of course, many of us still rely on such, but the huge innovation in the past 23 years has been the development of affordable, hand held global positioning systems. GPS. It used to be that, when hiking in canyons, we would look at the bends in the canyon walls, consider side canyons, think about how much time it had taken us to get from our last known position, and make an educated decision about position. These days, it is turn on the GPS and let it tells us exactly where we are, to within 10 or 15 feet. I owned my first hand held GPS by early 1995. It was ridiculously expensive and operated on a single channel. That meant that you had to stand in one spot, wait for it to lock on to one satellite signal, then lock on to a second one, then a third and then a fourth. Hiking in forests meant that sometimes, it would take 15 minutes to get a position fix. But the receivers got more sensitive, and in the late 1990’s, President Clinton, at the urgings of his Vice President, removed “Selective Availability” from the civilian GPS frequencies, and accuracies improved dramatically. By the latter part of the first decade of the 21st Century, most higher end hiking GPS units had high sensitivity chips, which meant they could work easily under a forest canopy. GPS units have become so ubiquitous that high sensitivity chips are in every smart phone you can buy, or at least nearly every one. And in some dedicated GPS units, you can take advantage of the Russian GPS satellite constellation. But an experience on our 2012 canyon backpack is a good reminder that you have to understand and appreciate the limitations of any GPS. Due to signal bounce, the GPS reported that we were standing on the canyon rim of the Escalante, when in fact we were about 10 feet from the water’s edge of the river. Technology can be great, but its always a good idea to be able to read a map. 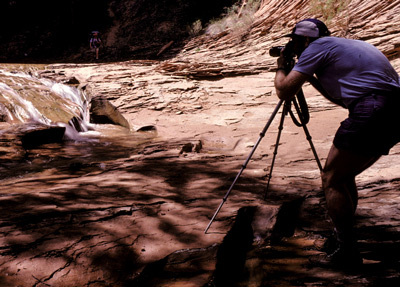 Speaking of technology, probably the biggest change that has occurred related to hiking is the nearly absolute move to digital photography from film cameras in the past 23 years. In the photos for the 1992 trip, you will see several of us carrying tripods, with small film single lens reflex (SLR) cameras mounted on top. Tripods?? On a backpacking trip? Why on earth? Well, the answer is that many of us were shooting Kodachrome 25, that remarkable fine grain film that did such a good job with the reds of canyon walls. Kodachrome 25 had a light sensitivity of ISO 25. That means you had to expose it to a lot of light to get a good image. That meant longer shutter speeds than you could hand hold, and that meant carrying a tripod. For many of us, it became our walking stick as well. Today, I don’t think there is a camera that has an ISO setting as low as 25. The good ones go down to 100, but most cameras have an auto-ISO setting that will adjust, based on the light available. And then there was the cost and weight associated with shooting film. Typically, I would take 20 rolls of 36 exposure film with me. At 1.1 oz per roll, that is approaching 1.5 pounds of film, to take 720 shots (of course, if was shooting slide film, one has to bracket exposures carefully – typically ½ stop up and ½ stop down, so the 20 rolls of film were only good for about 240 images). Each roll cost about $9 (worth about $15 today) to shoot and process, which works out to be 25 cents every time you pushed the shutter release. Ouch!! Today, of course, one 32 GB SD card will hold a couple of thousand images and weigh next to nothing. Now, all these digital electronics require power, which means batteries, but even a couple of spare batteries don’t weigh that much, and on the whole, things are way better now. I confess that I have not been in the stretch described in this report since the huge flood of October 2006 that filled the main canyon wall to wall with water and debris. That likely-500 year flood has clearly changed a lot in the upper parts of the canyon, as we saw on our 2007 and 2012 backpacks. So it is likely that changes have occurred in the lower part of the canyon. But canyons are, by their very origin, “living” natural features. They change with time. At least every day, they change a micrometer or two. But some days, they change more. That is one of the many features that make them so interesting. AND so challenging in which to backpack. 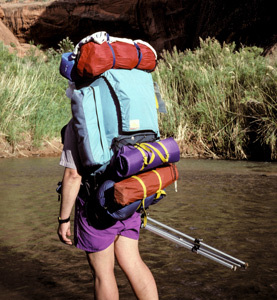 Ok, enough perspective: On with the show: The 1992 Escalante Canyon Backpack, from the Dry Fork of Coyote Gulch to Scorpion Gulch.